Kentucky Fried Chicken (KFC) has announced that, by the end of 2018, all of its chickens will be raised without the use of antibiotics medically important in human medicine. That qualifier is important, drawing a distinction between drugs used to treat animals and those that treat humans. Still, it addresses a major consumer among health policymakers. The Antimicrobial Resistance Learning Site at Michigan State University points out that many antibiotics are used both on animals and humans, and when it happens, it can hurt efficacy. For example, eating a lot of chicken or beef treated with human antibiotics might make that same drug less effective when it is administered to the person to treat an infection. "Making this change was complex and took a lot of planning,” said Kevin Hochman, president and chief concept officer for KFC U.S. It required close collaboration with more than 2,000 farms, most of them family-owned and managed, in more than a dozen U.S. states where they raise our chickens." Both environmental and public health groups have long advocated eliminating antibiotics used by humans from the food chain. Lena Brook, food policy advocate at the National Resources Defense Council (NRDC) calls the KFC move “a game-changer” for the fast food industry's relationship with public health. "The market is responding to consumer demand for better meat,” Brook said. “This commitment from the nation's most iconic fast food chicken chain will have a major impact on the way the birds are raised in the U.S. and in the fight against the growing epidemic of drug-resistant infections." In fact, when a fast food chain operating on a massive scale makes a decision like this, it has a way of sending ripples throughout the chicken industry. Last year, when McDonald's and several other large enterprises pledged to move to cage-free eggs, egg producers had to begin major changes to meet the anticipated demand. Food sourcing has become a major issue for restaurants because it has become a big issue for consumers. As we reported last year, small companies taking a holistic approach to food production have begun to shake up the industry, and the large players have been forced to react. In addition to its announcement about antibiotics, KFC pledged that by the end of next year, artificial colors and flavor will be gone from all core products. 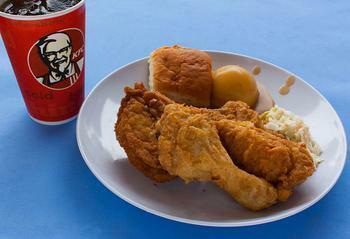 As of today, the company says all chicken, and most of its menu, is free of food dyes.